Are you suffering from "Movie Tie-In Fatigue?" Per a Bloomberg article, Star Wars toy sales are down. Specifically adult collectors are still buying (but, judging by some "fan" sites, they're complaining the entire time they shop); however, kids have less interest in the Star Wars toys. The article states: "While 'Star Wars' was still the top-selling toy line during the nine-week holiday period, sales fell from 2016 and the brand lost its No. 1 position for the year...This was despite “Last Jedi” being the top-grossing film released in the U.S. last year "
The most telling quotes? 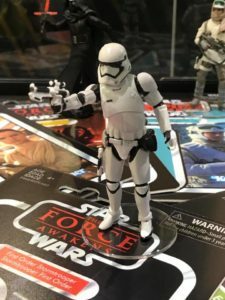 "Adult collectors, who grew up with the brand, are still buying a lot of merchandise when the toys come out, but demand dies down afterward... That doesn’t bode well for Hasbro, which has the main “Star Wars” toy partnership, or Jakks Pacific Inc., which has a secondary license. " What do you think? Is the problem fatigue? Is a new movie per year too much? Is it the types of toys offered? Why do YOU think sales are down? Let us know in the comments!